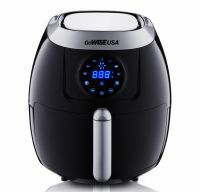 This air fryer has a 5.8-quart capacity with a wide temperature range of 170°F - 400°F. This air fryer has an auto-switch off feature when cooking is complete, and a standby/resume mode,Sliding the pan back into fryer will resume the cooking process. This air fryer has an auto-switch off feature when cooking is complete, and a standby/resume mode. To Recieve updates and possible rewards for GoWise USA GW22635 (White) please sign in. To Recieve updates and possible rewards for Air Fryer and Tandoor please sign in.